If girls in lingerie and dinosaurs mix in strange Internet photos, why not in fine art? 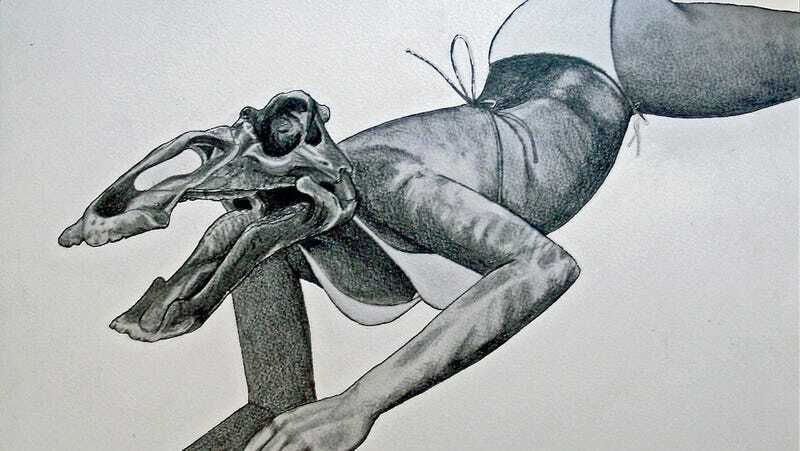 Artis Josean Rivera has filled his drawing pad with some unusual figure drawings, putting dinosaur skulls where his ladies' heads should be. Rivera explains that, when embarking on a new drawing series, he couldn't decide between sketching dinosaurs and female figures, and decided to compromise. The result is this strange skeletal series, blending fossils and the female form. If you're a fan of the Ceratopsian in the high-waisted skirt, Rivera is selling a t-shirt featuring the design.